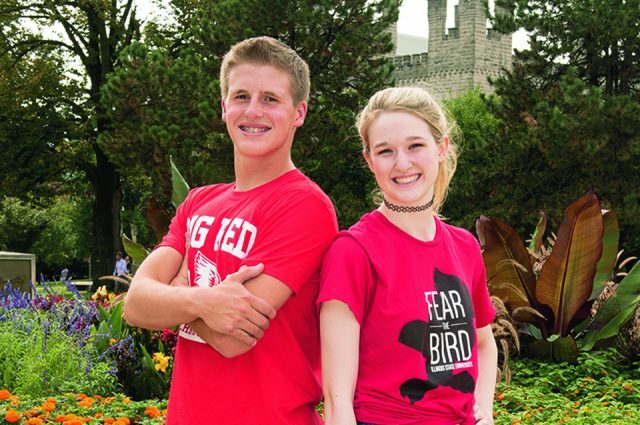 The Student Alumni Council/Marian H. Dean Legacy Scholarship is awarded to a limited number of sons, daughters, siblings, or grandchildren of Illinois State University graduates as a way to ease strain of college expenses and recognize legacy families continuing the Illinois State tradition. The nonrenewable scholarship was made possible by a donation from the family of alumna Marian H. Dean ’27, ’29 and contributions from Student Alumni Council and the Illinois State Alumni Association. The Alumni Association Scholarship was made possible thanks to an initiative launched by the Alumni Association in 2009. The scholarship addresses the accessibility of undergraduate education to students who exhibit outstanding academic achievement and leadership, and who demonstrate a financial need. Additional consideration is given to students whose immediate family members have attended or graduate from Illinois State University. Those interested in applying for either of these scholarships must complete an online application and essay questions as well as have two letters of recommendation submitted by December 2, 2016, at 4:30 p.m.